The story behind Seniors To The Rescue. The organization itself is a labor of love. Seniors to the Rescue was born in 2013 when founder, Gail Mayhugh, had to make the decision to move her mother, Terry, into an assisted living community. Gail soon realized that her mother had few volunteer opportunities and was becoming idle and bored. As someone who had worked hard her entire life, her mother still wanted to be useful and have a purpose. As Gail met with caregivers and residents, she realized this challenge was common among seniors. Each had their own story and their own level of physical and intellectual mobility. Often she heard stories of their pets who meant so much to them. From the time she spent visiting, Gail recognized their lost connection to the community and their shared love for animals. The rest is history. Gail and her mother launched Seniors to the Rescue, a 501 (c)(3) non-profit, with the help of the assisted living administrators. 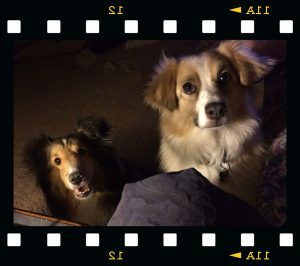 Gail’s adorable rescue’s, Matilda and Millie. The timing was perfect as Gail had become an animal rescue advocate, blogging about events and opportunities to help rescue animals and groups. She learned of the staggering number of homeless pets and the overwhelming needs of shelters and rescue groups when she rescued her own two pups. Their first program to be born was Boo-Boo Bags, pet first aid kits. 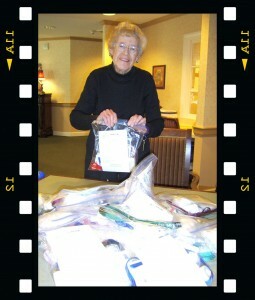 Seniors To The Rescue purchases each individual item for the Boo-Boo Bags and then gets together with the seniors volunteers to assemble them. The kits are then donated to animal rescues and shelters to use to raise donations. helping animals one project at a time. Seniors To The Rescue is a 501 (c) (3) nonprofit corporation. Your donations are tax deductible under Internal Revenue Code Section 170. All donations go to program costs and standard business expenses. Seniors To The Rescues has no paid staff, we are run entirely by volunteers.